Catherine Ashbrooke is a feisty, spoiled, and very witty member of elite English society. She pines for her true love, Lieutenant Hamilton Garner, a rather stuffy boor, in my opinion. On a hunt one day, Catherine decides to veer away from the crowd. Riding in a hidden glen, she confronts a gorgeous man washing by a stream. She's quite taken with him while telling him to get off her property at once. The scene is very well written and I had butterflies in my belly while reading it. The next night, during a ball, Catherine is introduced to her brother's friend, Raefer Montgomery - the man she encountered in the glen the day before. He invites her to dance and, while spinning around the floor, he kisses her. Hamilton sees this insult and challenges Raefer to a duel for Catherine's hand. Raefer wins and is thus betrothed to Catherine. And she isn't happy about it. At all. Once they leave London, Catherine discovers that Raefer is not who he says he is. He's not a London merchant but none other than a Highlander by the name of Alexander Cameron. Alex takes Catherine home to Scotland and they are both thrown into political turmoil. However, through this turmoil their love develops into a deep and caring bond. The Pride of Lions was a great read. 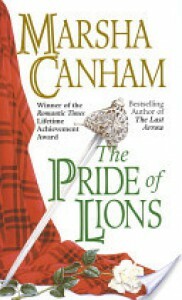 Marsha Canham brought the story and the characters vividly to life in this historical romance. I recommend it.